A Cold Pasta Salad makes a good summer salad recipe. It can also be served as an additional side dish for any party or dinner because it can be prepared ahead of time. With such lovely flavors, I think you just need an excuse to serve it. This recipe is low fat (You can avoid using the cheese altogether), easy to make, tastes amazing, looks great and is suitable for vegetarians. Although you can add some meat if you prefer. It will be a definite hit with your family and friends. 1 large tomato (skinned,deseeded and chopped). If you are using cottage cheese(paneer), it is a good idea to shallow fry the cubes till light brown on all sides, in a pan with just 2 tsp oil. Then drain on kitchen paper. This way they become crispy on the outside and still soft on the inside. Feta or cheddar cheese cubes can be added as they are in the end. Heat a pan (non-stick is best) and reduce the heat to lowest, then add the olive oil and garlic. Saute for 30 seconds and add the onions. Saute till the onions look glassy. Now add the tomato puree and tomato, simmer for 5 minutes. Add the corn, bell pepper, basil, paprika, Tabasco, sun dried tomatoes and salt. Cook till the whole mixture is no longer watery and vegetables are slightly cooked. Cool down to room temperature. To this add boiled and strained pasta. Toss well so that the pasta is evenly coated. Add the cheese cubes and olives. Mix well. Now let it cool and refrigerate till ready to serve. Sprinkle some grated Parmesan before serving. Enjoy your cold pasta salad. Tips:- To save some time you can easily make the red sauce in advance and freeze for up to a month. I always make more and freeze some. 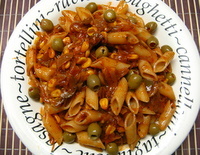 Then all I have to do is boil the pasta, add the cheese and olives and voila!